with the new 3D groove. The asymmetric tread pattern stiffens the tyre shoulder and provides optimum road contact. Auto Bild (issue 10/2011) has published part 2 of the "Super Summer Tyre Test 2011". The ACE (Automobil Club Europa) has published its Summer Tyre Test 2011 for the size 205/55 R16 V. Test vehicle was a VW Golf VI. The eagerly awaited results of the summer tyre tests carried out by leading motoring organisations in Germany, Austria and Switzerland have now been published. These reveal that the ContiPremiumContactTM 2 in the size 185/65 R 15 was rated as 'highly recommended'. 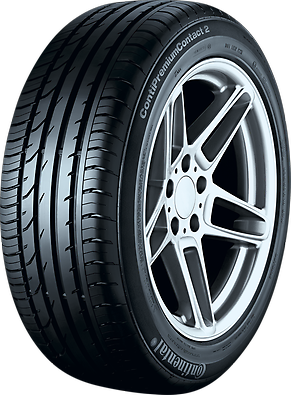 The ContiPremiumContactTM 2 earned top marks in the first summer tyre test of the year by AutoZeitung magazine (5/2010 issue, February 2010). Tested size was 205/55 R16 V. Test vehicle was a Mercedes C-Class. The following technologies are available for this tyre but not for each size. Please check here if one of these technolgies is available for your tyre size. The SSR system is a runflat technology developed by Continental especially for low section tyres, which still keeps the tyres compatible with all standard rims. The SSR principle is based on a self-supporting reinforced sidewall. In case of a puncture, this prevents the sidewall from being crushed between the rim and the road, and the tyre from slipping off the rim, which makes a spare tyre obsolete. Not having to carry a spare tyre means a reduction in weight, which improves fuel efficiency. It also adds up to 80 litres of free space in the trunk. Fitting on four positions is highly recommended, if not yet mandatory by law and a tyre repair is not allowed. ContiSeal™ is a technology developed by Continental designed to seal a damaged tyre tread. In case of penetration by foreign objects such as nails, there is no need for immediate roadside tyre changes, and holes remain sealed even if the puncturing object becomes dislodged. ContiSeal™ is a sticky, viscous sealant layer. It is applied to the inside of the tyre in the tread area. ContiSeal™ seals 80% of all tyre punctures and therefore reduces the risk of flat tyres. ContiSeal™ tyres are marked clearly with a symbol on the sidewall and are compatible with all commonly available rims.